We were very happy to have photographer Clive Gray stop by Nkosi’s Haven in late June 2013 during the visit from artsINSIDEOUT! Thank you for sharing your time and talent with us! You can find these and many more of his beautiful photographs here. On Saturday June 1st, 2013 we celebrated the life of Nkosi Johnson. Through song, dance and prayer we keep him alive in our hearts and thank him for the inspiration he provided us all! Pajama Party thanks to Aids Fonds and 4Life! Just in time for the South African winter our kids, moms and caregivers received warm, fuzzy pajamas, robes and slippers to bundle up in! Many thanks and gratitude for the generous donations from both Aids Fonds and 4Life Research. Birthday joy for Nkosi’s Haven kids – Be part of it! Perfectly on time as an Easter Surprise we received a donation from Standard Bank! The kids were all over the moon when they saw the two new colorful Wendy Houses. With their bright colors they fit perfectly in the Nkosi’s environment. Our many thanks go to Standard Bank! Your support is highly appreciated! Children at Nkosi’s Haven opening their present on Christmas Day with Gail playing ‘Mother Christmas’. We are exceptionally grateful to Nina Venjakob who did her Annual Christmas Present drive to her entire data base – the responses was overwhelming – thank you all so very much. Mark and Nikki Garden who annually twist the arms of everyone at Edward Nathan Sonnenbergs and Webber Wentzel Bowens firm of Attorneys delivered over 145 presents to the Haven which were brought down to the Village for Christmas Day – thank you all so, so much for always remembering and caring for the children of Nkosi’s Haven – you are stunning. Eriger ALWAYS remember the children and over 145 ‘lucky packets’ had been made up, relevant to age with stunning, practical goodies in and of course ‘sweeties’. And many a private person dropped off presents for children of certain age groups or specific children that they have met during the year – thank you!! The Nkosi Kids were invited for the third year to Max and Merle Viljoens Feathers and Fur Party Farm in Bredell. Merle spent part of her childhood at the JCA and Strathyre childrens homes and has over the many years I have known her taught me a lot about giving and sharing. Her dream has always been to have farm animals and to build a party farm. Her main business is Triple M Kennels and Cattery for animals boarding, but this has spilled over into many other permanent enclosures housing many rescue cats and the newest two enclosures housing dogs that were rescued from the Bapsfontien squatter camp when it was torn down earlier this year and have been unable to find homes. Most of the farm animals are also rescue animals and presently there are cows, sheep, goats, miniature horses, geese, rabbits probably over a 100 chickens, and of course Betsy the donkey. Merle has done an incredible job taming and keeping the farm animals tame, and this eventually led to the party farm. 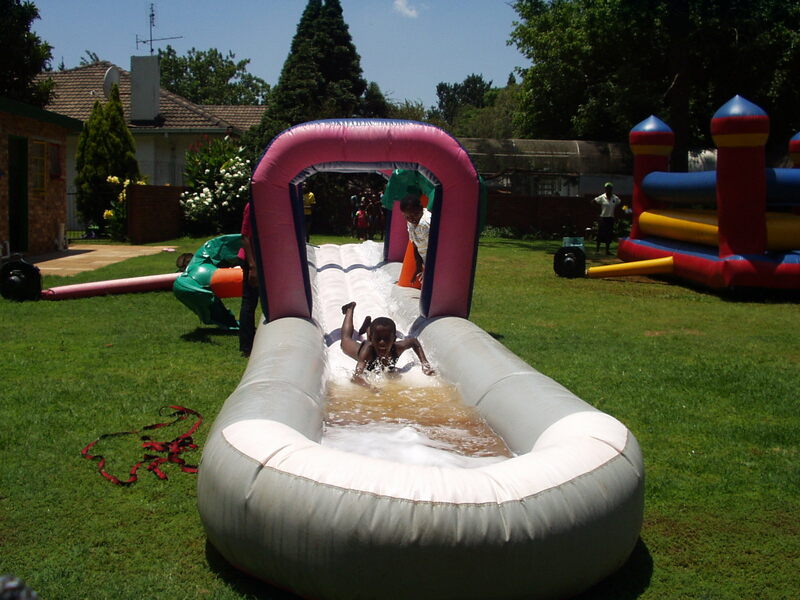 This year there were over 40 kids and as usual the main attraction was the water slide. I was amazed at the under 5 year old kids who had no fear of the water and enjoyed it as much as the older kids. The biggest problem was that they did not have the body weight or the co-ordination to slide down it, so we improvised and ended up pulling them down with a rope. So long as they were able to hold onto the rope, it worked well. The 6 to 12 year olds all eventually got the swing of things and flew down. Best slider this year was definitely Minently followed by Petros. Next popular was the trampoline followed by the swings. Thabiso was really great with the smaller kids, and whenever I looked, he was pushing them on the swings or was on the trampoline with them. Johanna was unbelievable. She controlled the water slide most of the day with either Fatima or myself, and the day would not have run as smoothly without her help. Zetu and Zintle were a huge help preparing and dishing up lunch. We again had hotdogs. I know it a bit boring, but it’s easy as there is no cooking involved, and it’s easy to heat the sausages (I use Merle’s kitchen in the house).